Pineapple Skillet Fajitas were inspired by one of the members, (Small Girl, Strong Why) who is on the Fatdag Blog team where I post as a guest blogger. I am proud to be a member of their non-profit team-Operation Fatdag. My friend recently visited Manola a restaurant in Mississippi, and snapped a picture of her meal-Pineapple Fajitas and sent it to me. It sounded so intriguing that I decided to try my hand at creating it. Not sure if my version measures up to theirs (since I’ve never tasted theirs) but my version is very delicious and definitely a crowd pleaser! How do I serve Pineapple Skillet Fajitas? 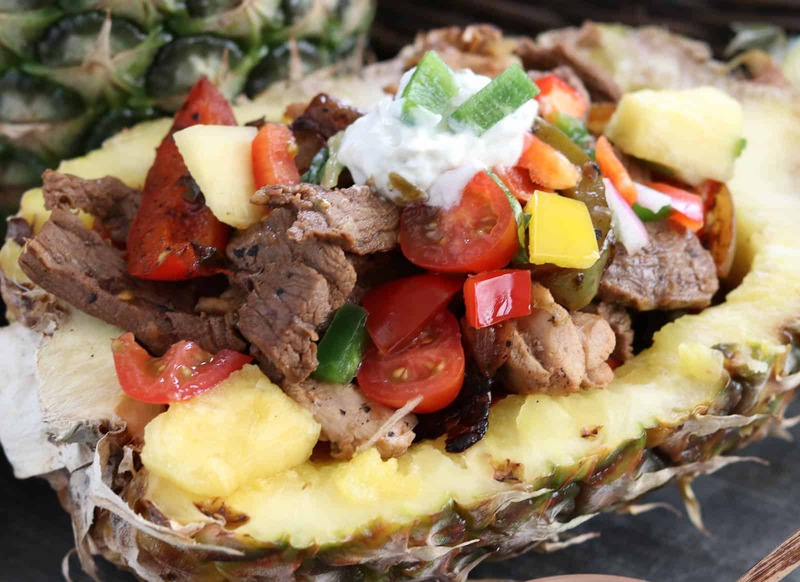 You can serve the Pineapple Skillet Fajitas with my Homemade Flour Tortillas or as eat them as a stand alone (less carbs) in a pineapple boat. I like to use a mixture of beef and chicken but you could also include shrimp. Be sure and serve with my Pineapple Salsa, topped with a bit of Jalapeño Cream. Why do I need to use fresh or frozen pineapple juice? Be sure to use fresh or frozen pineapple juice with this marinade. The enzymes in the pineapple tenderize the meat but are not present in canned or bottled pineapple juice. 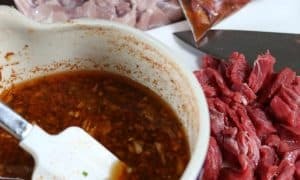 I like to mix up the marinade in a bowl, cut the meat and place it in a Ziplock bag, then add the marinade. If I’m pressed for time (less than 4 hours), I’ll put the marinade in one of my Food Saver Bags and seal it up and marinade it for less time. Do I need to use a cast iron skillet or can I do them on a grill? 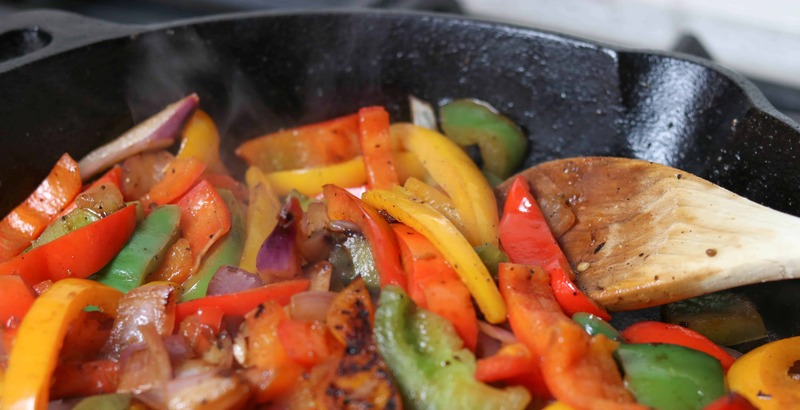 Use a cast iron skillet on high heat for best results when cooking the fajita vegetables and fajita meat. This allows the vegetables and meat to slightly char. Of course you could always cook them on the grill in a basket but these are “Skillet Fajitas.” It’s important to really drain the marinade off of the vegetables so they begin to char. After they are almost done and charred, you can add a bit of marinade back in to help sweeten and caramelize the onions. 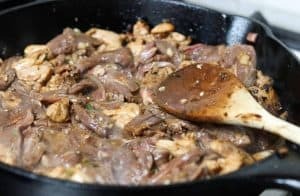 Why should I drain off the marinade while cooking? When you cook the meat, again it’s really important to drain off the marinade before cooking, otherwise you will “stew,” the meat. If it seems there is too much liquid, drain more off while cooking. If I’m doing a combination of flank steak and chicken, I’ll start the chicken first in the cast iron skillet, then when it is mostly done, I’ll add the steak and cook until desired steak doneness. Here they are! 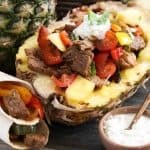 Pineapple Skillet Fajitas! So yummy! 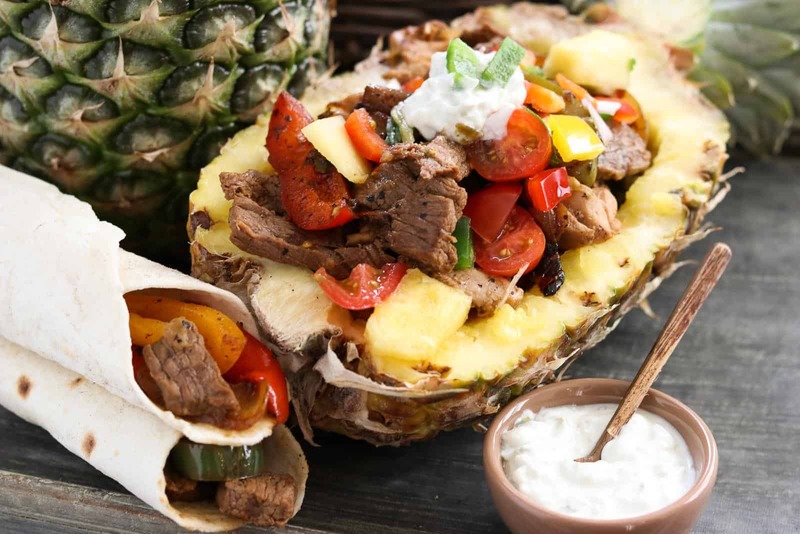 This Pineapple Skillet Fajitas marinade is great for steak and chicken. Marinate the meat and vegetables 4-6 hours or overnight. In a medium size bowl, combine: pineapple juice, soy sauce, Chipotle seasoning, oil, water, garlic, jalapeño, minced onions and the juice of 3 limes (save the last lime for the end of the cooking phase). Mix well. Reserve 1 c. marinade for the vegetables. Add the meat to the marinade bowl or put marinade and meat in a Ziplock bag. Mix well. Refrigerate 4-6 hours or overnight. Place the vegetables in a bowl or Ziplock bag and add reserved marinade. Refrigerate 4-6 hours. When ready to cook, heat a cast iron skillet (for best results) to high heat. If using a non-stick skillet use medium heat. Add 1 T. oil. Drain marinade from meat and vegetables using a colander. If you don’t drain the meat and vegetables, you will have too much liquid and will end up stewing your meat instead of frying it. Feel free to save a bit of the vegetable marinade to add back in if you need a bit more moisture. When skillet is hot, add vegetables and cook until almost done. If you do a lot of vegetables, you may need to cook it in several batches. I like mine a bit charred from the cast iron skillet. Remove from heat and set aside. Add meat to skillet and cook until done, 165° for chicken and at least 145° for beef. You may need to add a bit of the marinade or oil if the pan seems too dry. When meat is done, add vegetables back into pan, juice of 1 lime and cook for another minute or until vegetables are heated. At this point if you want a bit more “sauce,” add more of the vegetable marinade. Serve in hollowed out pineapple shells or with tortillas, topped with Pineapple Salsa and Jalapeño Cream. Freeze the left-overs for a quick meal later. Pineapple contains an enzyme which tenderizes meat naturally. This enzyme is destroyed in the canning process, so canned or bottled pineapple juice won’t work to marinate meat but fresh and frozen pineapple juice will work well. Be sure and drain the marinade before cooking the vegetables and meat. If you need to “stretch” this dish a bit to accomodate more people, you can just add a few more peppers and onions. 1 Reply to "Pineapple Skillet Fajitas"
Such a great recipe! Can’t wait to try it! Love the idea of serving it in a pineapple boat!